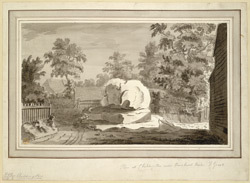 Drawing of a stone at Chiddingstone in Kent. Chiddingstone is a pretty one street Tudor village, with mainly 16th and 17th century houses. This carved sandstone boulder, is known locally as the 'Chiding Stone'. It is not known exactly what its purpose is, but local legends suggest that nagging wives or wrong doers were brought before the stone to be told off or 'chided' by the village. The stone lies beside a path in the park of Chiddingstone Castle.